Finished size: approximately 12” square, excluding straps and drawstrings. Sew all pieces with right sides together and a 1/4” seam allowance unless otherwise noted. Just in time for soothing away those mid-summer, "I'm bored" blues... a project for packing up the fun found in summer! Kim Diehl, has generously put together a little tote bag project for us using Bumble Garden flannels, a new collection that will be shipping into quilt shops in September! 2. Join a casing print rectangle to each short end of the base print rectangle. Press the seams toward the casing print. 3. 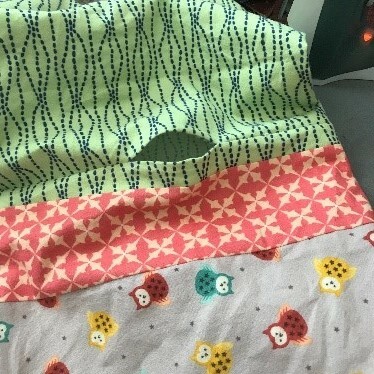 Join one short end of the lining print to one casing print rectangle. 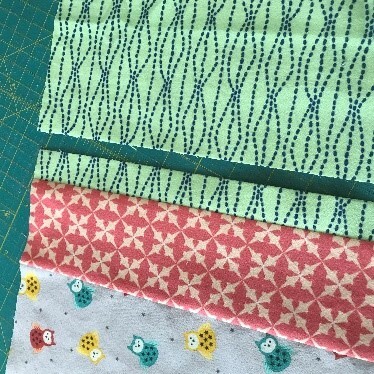 Repeat with the remaining end of the lining print and the second casing print rectangle to make a large stitched tube. Press the seams toward the casing print. Press the seams toward the casing print. 4. 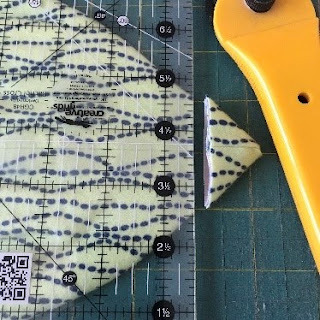 Using an acrylic ruler, measure 1” out from the casing print seam where it joins the lining; use a rotary cutter to cut the fabric at this point. Repeat with the remaining rectangle of casing print, again cutting through the lining print. You’ll now have one long rectangle of lining unit, and one long pieced outer unit. 5. Fold each step 4 unit in half, right sides together, with the short raw ends aligned. 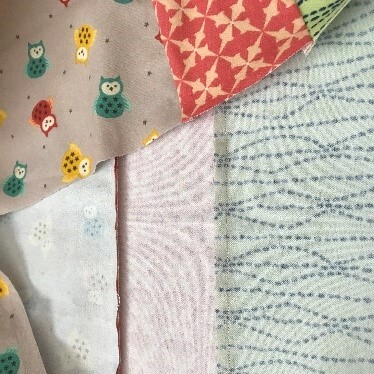 Lay the pieced and folded outer unit only flat on a table top; measure 2” down from the top raw edge and use a water-soluble marker to mark this position at each side edge. Measure 1 1/2” down from each of these marks, and repeat (this is to show where the casing openings will be). Pin the long side edges of the outer and lining units. 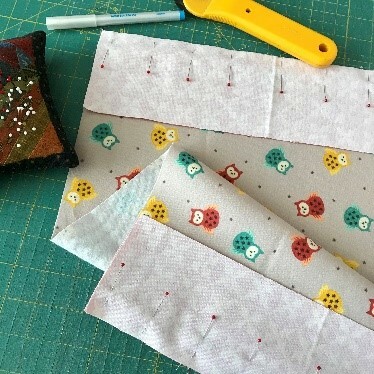 Beginning and ending with several backstitches, sew the long side edges only of each unit to form a bag shape with an open top, leaving the areas between the marked positions of the outer unit unstitched. Press the side seams of each stitched unit open. 6. Turn the stitched outer unit only right side out; insert it into the lining unit as shown, aligning theside seams. (The units should now be resting with right sides together.) Pin the top raw edges. 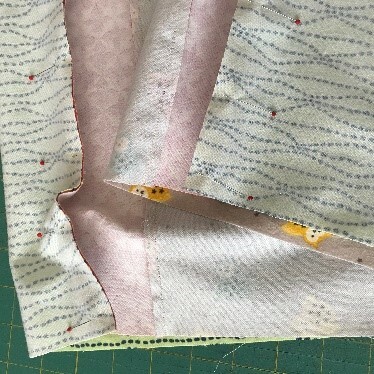 Beginning and ending with several back stitches, sew the top pinned edges, leaving an unstitched 3” opening at the center of one unit side for turning. 7. Turn the stitched unit right side out, using the 3” opening. 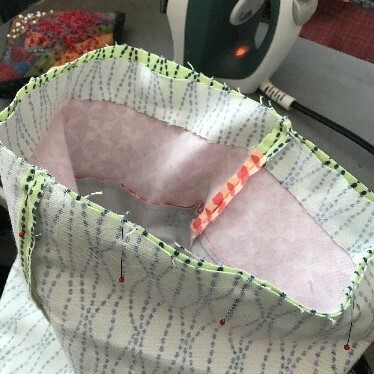 Smooth the lining unit into the outer unit, with the sewn seam positioned at the top. 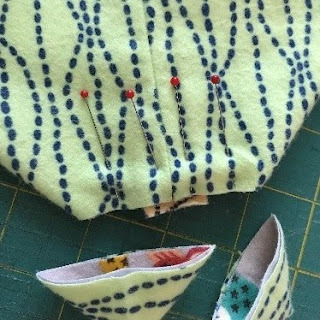 Press the unit’s top edge, turning the unstitched lining print to the inside; pin the top edge to anchor the layers and prevent shifting. Stitch the unit a scant 1/8” in from the top pinned edge. 8. Lay the unit flat on your work surface. Measuring down 1 3/4” from the top stitched edge, use a water-soluble marker and an acrylic ruler to draw a horizontal sewing line across the casing print. Measure down 1 1/2” from the first drawn line, and repeat. In the same manner, mark the back of the unit. (These drawn horizontal lines should coincide with the side openings from step 5.) Pin the unit through the casing print layers to prevent shifting. 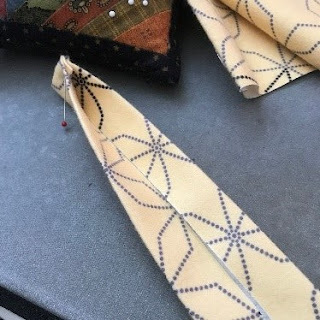 Beginning at a side seam, stitch the layers together along each drawn line to form the casing. Blot the marked lines with a damp cloth or white paper towel to remove them. 9. 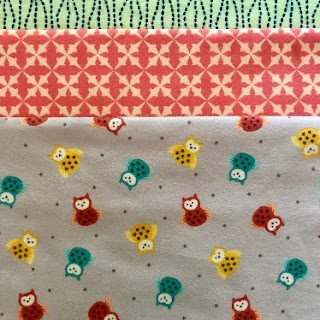 Fold the long outer edges of one 3”-wide drawstring print strip to the center as shown. Press. Fold one end of the strip over approximately 1/4”. Press. Next, fold the strip in half at the end to encase the raw ends (the remaining raw end of the strip will later be enclosed within the back pack seams.). Press and pin the folded end. Continue pressing and pinning the long side of the strip to anchor the folded edges together. Stitch the pinned end and long side of the strip a scant 1/8” in from the edges to form the drawstring. 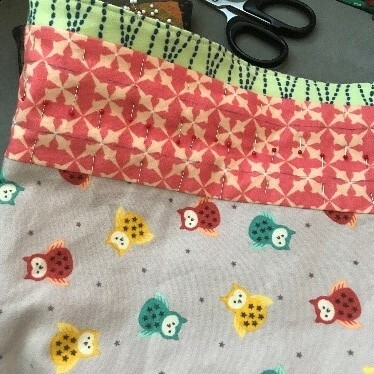 Repeat with the remaining strip to make two stitched drawstrings. 10. 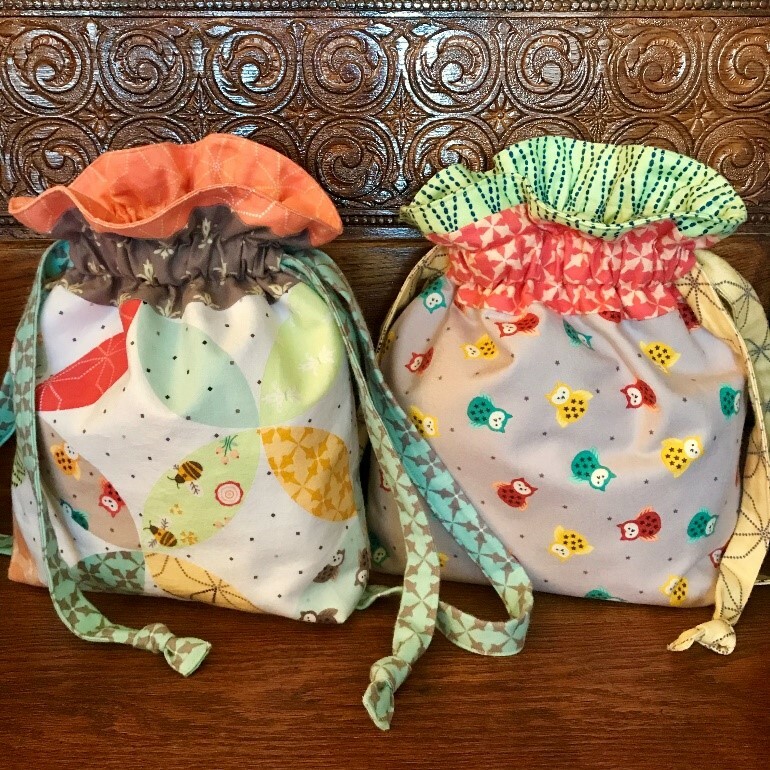 Use a sturdy safety pin at the raw end of one stitched drawstring to thread it through the sewn casing, beginning and ending at one side opening. (After threading, both strip ends will be extending out from the same side opening.) Repeat with the second strip, beginning and ending at the remaining opposite side opening. Knot the stitched end of each drawstring; it’s not necessary to knot the raw ends. 11. Turn the unit inside out. With the sewn side seam of the unit centered from side to side, smooth it flat and lay it onto a cutting mat as shown. Measure 1” out from the folded bottom corner of the unit; trim away the tip. Pin the layers at each side of the trimmed opening, leaving the center area unpinned. Repeat with the remaining bottom corner of the unit. 12. From the inside of the unit, insert the unknotted end of one drawstring into the corner opening on the same side (this will form the strap); pin. Repeat with the remaining corner of the unit. Stitch each pinned corner through all layers to encase the raw strap ends. (For the sake of sturdiness, I stitched across these openings three or four times each.) If desired, apply liquid seam sealant (such as Fray Check) to the raw corner ends, or finish them with an overcast or zigzag stitch. 13. Turn the finished back pack right side out. Press. 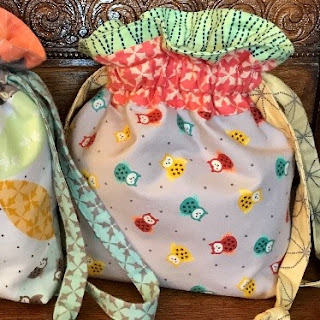 Adjust the straps to the needed lengths using the drawstrings, and slip it onto your favorite little kid!